MCA vide its notification dated 20 January 2018 has amended the Companies (Incorporation) Rules 2014 and the Companies (Registration Offices and Fees) Rules 2014 notified the Companies (Incorporation) Amendment Rules 2018 and the Companies (Registration Offices and Fees) Amendment Rules 2018 respectively which shall be effective from 26 January 2018. Form INC-1 (Application for reservation of Name) has been replaced with form RUN (Reserve Unique Name). Name application can be made without DSC requirement. Form INC-7 (Application for Incorporation of Company) has been done away with. Form INC-3 (One Person Company- Nominee Consent Form), Form INC-12 (Application for grant of License under Section 8), Form INC-22 (Notice of situation or change of situation of registered office, Form INC-24(Application for approval of Central Government for change of name) and Form INC-32 (SPICe) has been amended. RUN is a simple web-based form for reserving the name of the company. To apply for a name using RUN web form, the applicant must first create a free MCA account through which user can choose the type of company and one name choice. Alternatively, if the applicant wants directly incorporate a company without reserving the name (through RUN), he can file for incorporation forms using SPICe form. If the applicant wants to incorporate a company with a name that could be similar to an existing Company or LLP or Trademark then prior approval can be obtained from MCA for use of the name. Further, NOC from such registered trademark user shall be obtained which shall be attached to the RUN web form. Maximum Attachments size shall not exceed 6 MB. Under RUN service, the fee for name reservation through the RUN form is Rs.1000/- per form submission, irrespective of whether the name is approved or not. Resubmission option is not available, the proposed name may either be accepted or rejected directly. Pay later option is not available in RUN service. Processing will be in Non-STP mode. After verification by the MCA personnel at the Central Registration Centre(CRC), name approval/rejection letter would be provided by the MCA subject to the test of similarity and the applicant will be intimated through the email address registered with MCA. 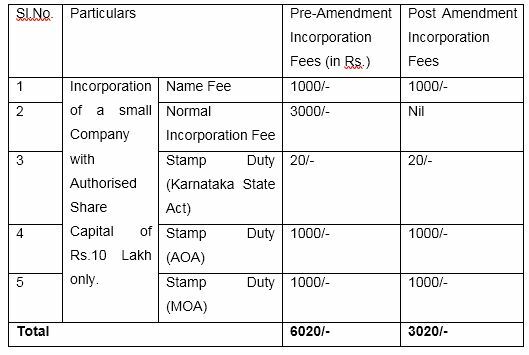 Further, zero fees for incorporation of all the companies with authorised capital up to 10 Lakhs and registration of company without share capital whose number of members does not exceed 20 members although stamp duty has to be paid for the same as per the applicable state act. This entry was posted in regulatory updates and tagged Company Name, Incorporation of a company, MCA, RUN on January 31, 2018 by novojuris.